“Police Chief Richard Molinari, along with Police Officer Chris Scardino and Police Officer Carlos Pina and the Union City Police Department would like to present this check to the American Cancer Society,” says Cultural Affairs Director Lucio Fernandez. During Breast Cancer Awareness Month, Scardino was not able to present a check yet because there was still a goal to reach. “At first the goal was $2,000, we passed that; $3,000, we passed that; $4,000, we passed that; $5,000 we passed that; $6,000 we passed that,” the police officer says. They sold hats, t-shirts, buttons, gum… you name it; they sold it, to raise money for breast cancer. The commissioners thank the mayor and chief of police for running such a terrific police department. 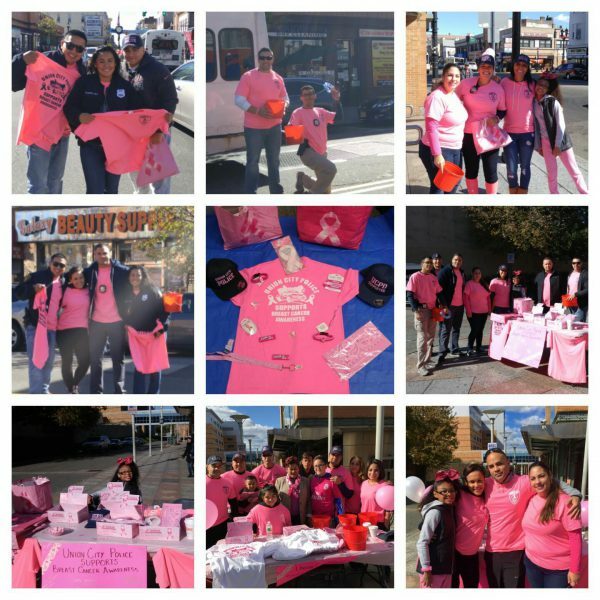 “We’d like to take a moment to recognize a police officer who works day and night for all these causes, whether it be breast cancer, Special Olympics, so many things… Police Officer Chris Scardino,” Fernandez says. A proclamation by Mayor Brian Stack honors Scardino for his dedication to the UCPD and the town’s residents. Whenever Scardino asked the mayor if he could do something, he wasn’t asking for himself. “You can’t say it was about me or them or who, it’s about others,” he says.